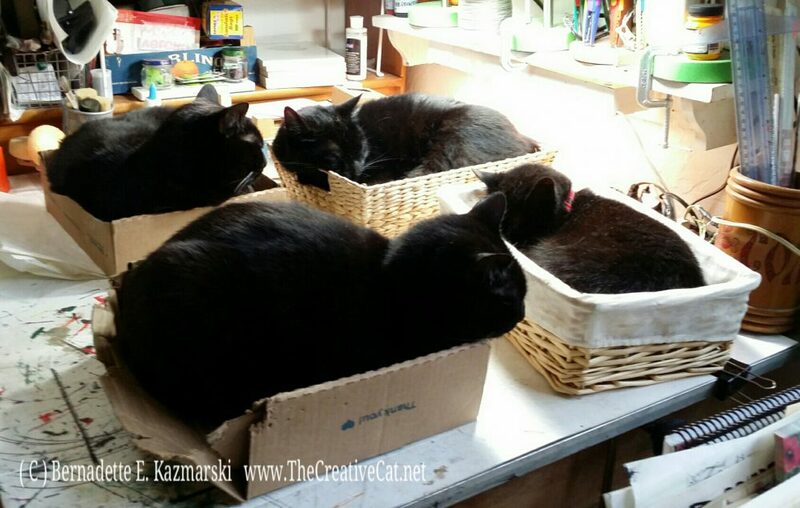 Neatly packed in their baskets. The party began on Thursday when I needed to begin touching up, creating, tagging, labeling, packing and otherwise working with the merchandise for Sunday’s event. It really doesn’t surprise me any more when I set up my display and items have no price tags or information, so I aspire to go through everything each time, at least for these first few events of the year. But you can see I likely didn’t get too far with that exercise, except for things I could do without the table, which was to check over items in plastic bins and hold the ones that needed some work. 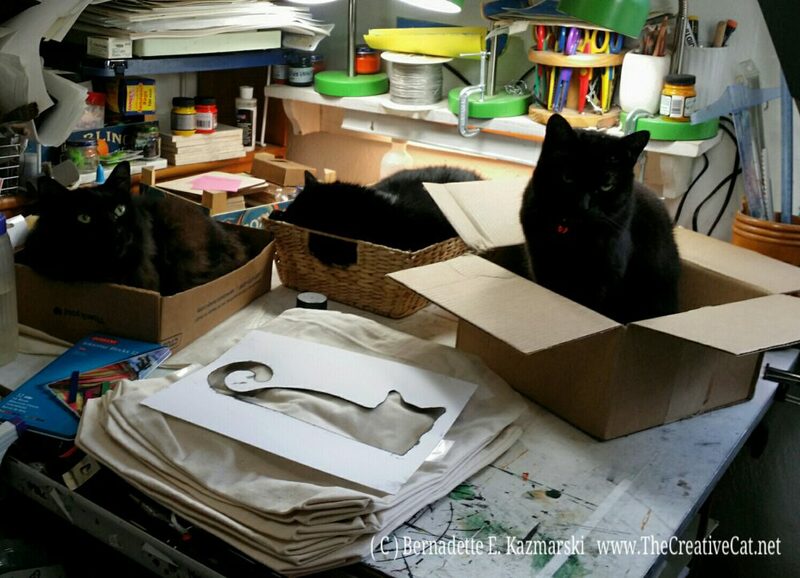 To say I love it when my cats share my studio with me is an understatement. From the very first, decades ago, I know they sensed my joy in what I was doing in my studio and joined me in whatever way they were comfortable, sometimes sitting on the windowsill or a chair and watching me, sometimes getting paws in the action if it was safe, and sometimes observing from a safe distance, just being in the milieu of happy energy. 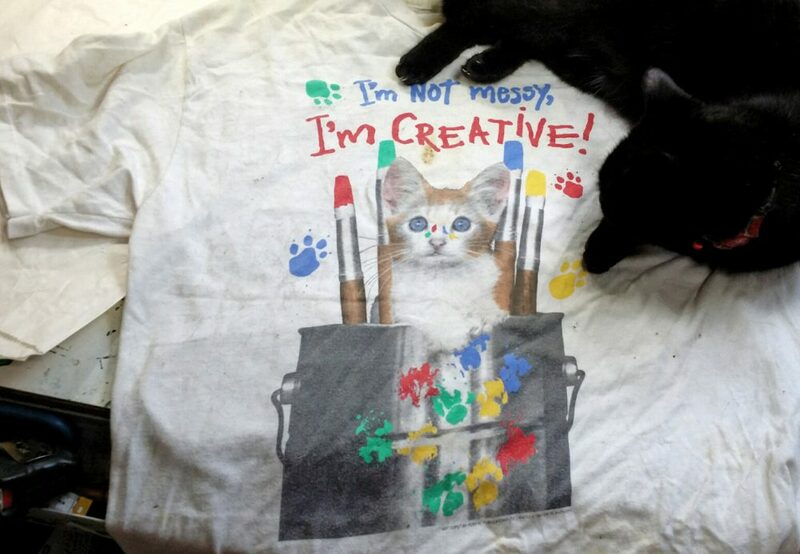 For all the cats I’ve rescued, fostered and socialized, I will always believe that their joy in sharing my joy in the studio was an important part of socializing and integrating everyone into a family of felines, my “creative cats”. The very next day I really had to use the table to touch up the finishes on a few keepsake boxes and add labels to a few others, and pack some prints. Mimi found a solution to that, however. 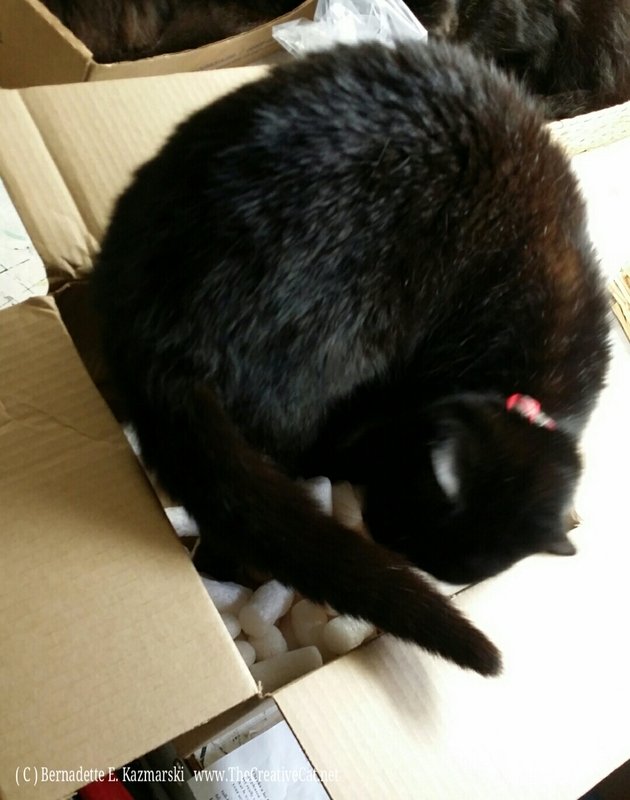 Mimi nests in the packing peanuts. Five in the studio, sleeping. I ran some errands and came back to it later. Finally, getting to the fun part. Mimi bathing on the bag while I attempt to sew buttons on it. I enjoyed all the moral support, and I did manage to get everything ready! What was I working on in some of these photos? See below! Must be good days for working in the studio. 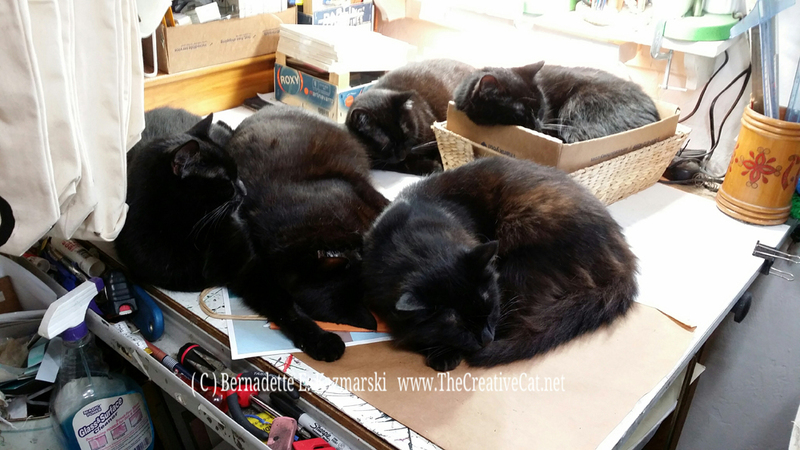 So how many colors are in a black cat? I see many colors in Giuseppe, especially the warm sunlight flowing in the window and the cool blue light reflected from the sky right next to it, along with all his wonderful mahogany and burgundy and even green and purple tones in his fur. Black, like white, contains many colors. But I don’t think Giuseppe cares at all about what colors are in his fur. I think he’s thinking about Mlle. Daisy Emerald Marguerite on the beginning of this Memorial Day weekend. Not at all like Mewsette, below, from 2014. Bean yawns as Mimi looks bored to tears. Sorry to bore you, Jelly Bean, as I earn your daily bread! Mimi sits over on the windowsill looking dazed and confused. Am I the only one around here having a productive day? But then, what is a productive day for a cat? 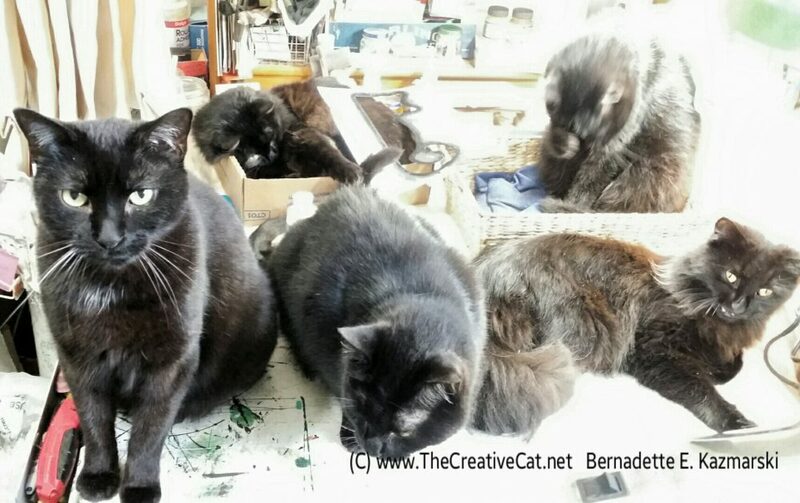 Actually, both of them are miffed at me because I wouldn’t let them on my work table. 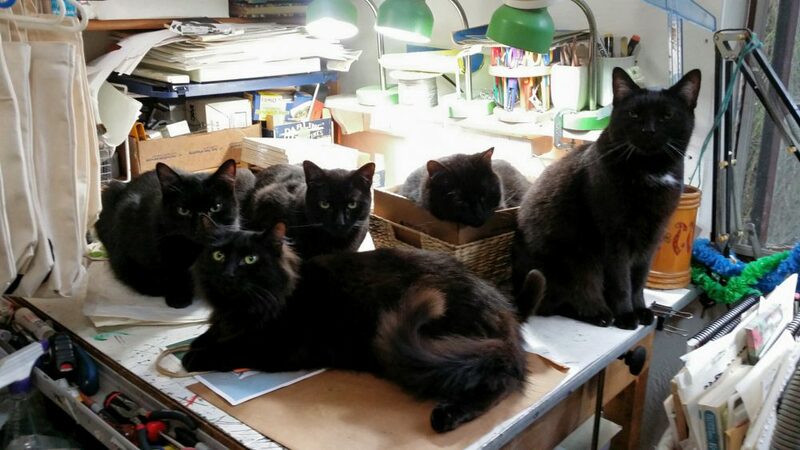 Sorry, black cats, other people don’t find your fur charming when it’s framed into their pictures. You only want to be on the table when I’m using it, otherwise you have no interest. You know I eventually lost this argument, as you can see below when Mr. Sunshine took over my framing tools. Mr. Sunshine can use two tools at once. My mom thinks I’m helping her work, but I’m actually doing a lot of the work myself. Look how well I’m handling both the spool of that really fun plastic-coated wire—and you know how I love my plastic—at the same time as I am tasting one of those long metal things. I can do this! Just lay everything out in front of me and I’ll take care of things. Everything must be tasted; mom laughs and says I relate the the world by chewing on it. I don’t know what that means because how else could I determine anything about an object I’ve never seen? Or one I have seen but haven’t seen in a while? Or one I see all the time but just feel like I have to bite it? I even let mom use my tools as long as I’m not using them already. Here I am when the work is all done. I’m very proud of my work. Mr. Sunshine is proud of his tools. Feline logic, it just can’t be argued with. Bella! 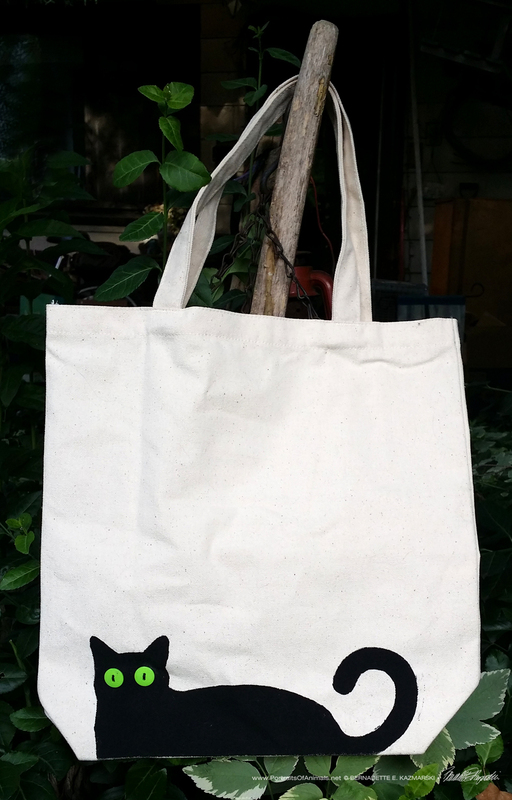 Tote Bag from Portraits of Animals! So what was I working on in a few of the photos above? A very new design and product: the Bella! Tote Bag! O.M.Geeeee! It’s Bella! On a bag with green button eyes just like her big round eyes! This new idea couldn’t wait any longer, Bella, in silhouette, at the bottom of a bag and with just big blue-green eyes that are two-hole buttons sewn on with black thread. You can purchase it right her or read more, and purchase. Tabbies, they were making me yawn!